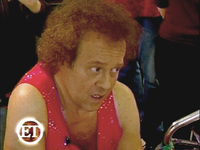 On "Entertainment Tonight," bed-ridden, 400-pound Jeremy Norman of Ohio was visited by Brillo-headed fitness guru Richard Simmons. (I think only Norman's leg must have on the scale at the time, but I digress.) One is a breathtaking, one-man freak show; the other is a kid who needs to lose a few pounds. Norman and his wife met in a chatroom, his enormity igniting some sense of Christian duty within her. True to form, the sequined nightmare blubbered through a pledge to help the adipose 21-year-old get down to 200 pounds. Somehow, Simmons' overwrought antics didn't trigger cardiac arrest in his latest subject of exploitation, although it likely triggered gag reflexes nationwide. As the final week of 2005 gains steam, we can expect to see endless lists, top tens, bests, worsts, and mainly reminders of things we'd totally forgotten about. So it is with television. E! 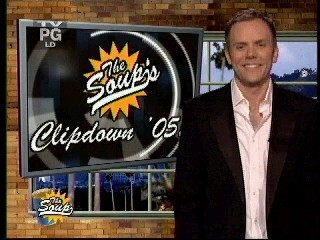 's The Soup recently compiled a list of the top 40 television clips of the year. Of course, they have excellent taste. Many of the clips they selected have appeared on Malcovision over the past few months, including an inexplicable visit to Katrina ravaged New Orleans by Richard Simmons, the Harry Potter and Ron Weasley boy crush, and - of course! - the appearance of Margaret "dark-sided" Perrin. In this highlight clip, we're treated to Barbara Walters' strange homophobia, a reminder that Rosie O'Donnell embarrassed herself as a mentally-challenged woman while the audience howled with laughter, lesbians dressed as Boy Scouts, George Takei's frank interview about his homosexuality, Kirstie Alley lusting for food, a Brokeback Mountain spoof, and The Soup's #1 clip of the year . . . Whitney Houston turns out to be Republican.